Yay, today's a fun holiday meant for hitting the sales and then BBQing with friends! Are we confusing Memorial Day with Veterans Day? I reached out to my friends who have served/continue to serve our country and asked them how they feel about Memorial Day. Specifically, what this day means to them and what it should mean to all of us. I think I view Memorial Day differently than most. I have lost a few friends to the war, even my roommate, so I think of them a lot during this weekend. I think it is good that people get out and have fun. That is the freedom for which so many have fought and died for in this country. But I would like those people to remember why they have this holiday and stop and think about those who have paid the ultimate price. To be honest with you, I personally look at it as a holiday for my efforts honoring those who have given everything. Memorial Day has taken on a new meaning after marrying John... it's a bittersweet day, but a day filled with more than fun BBQs. Over his time here, John has had to notify three families that they lost their sons/husbands over in Afghanistan and that hit really close to home for us all three times. Last year, John was asked to speak at a ceremony at a cemetery on Memorial Day and he spoke about those three that gave their lives serving our country. You see how much they and their families have sacrificed and whether I believe in the war, it really makes me so emotional and I want to give them the respect they deserve. 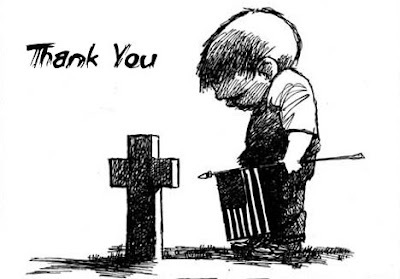 So, we probably will grill out if it's nice, but I know for a fact that every Memorial Day we will make a point to go to a ceremony wherever we live in order to give honor to those who made the ultimate sacrifice. Even just hearing the national anthem brings me to tears these days because I think of all the men that believe in our country and fight hard for our freedoms. I can go off about how much it angers me that our news reports were obsessed with the stupid wedding in the UK, but have now stopped really covering the stories of the men and women that still are losing their lives or getting badly injured fighting over in Afghanistan. UGH! I loved how so many people rallied together in support of America and excitement for our country when they killed Osama, but that died down so quickly... it's just sad. That motivates me to want to make sure that at least me and my family will never forget those still fighting. I have friends who just sent their husbands over there for 9 month deployments. I think it's really fantastic that you did this. To be perfectly honest, I never really took the time to consider the differences in the two. A lot of these points resonated with me. Having so many people close to me in the Military (Including my sweetheart), I appreciate your post. I agree, many people today have been directing attention to Veterans, and not so much towards the ones who have had their lives taken from them much too soon. I see Memorial day, as a day to remember the ones who have had to struggle with the effects of War, as well. The families who live each day without their loved ones, and The Veterans/Active Duty who struggle Mentally and physically. Just watched the Memorial Day Service at Arlington National Cemetery, VA. Have to say I'm a little pissed off that most of the camera time was on Obama. It's not about him, even though he is Commander & Chief. I would rather they showed more of the all the soldiers. Obama gets enough camera time - this is for our military, not him! A.MEN. I've had people in my family serve in the Military, once which is in Iraq right now, and I say it always and I will always say it, the people in the Military are MY HEROES. thanks for posting this. wonderful! my husband is serving overseas right now and we have lost some great friends. this means a lot! Being the fiance of a wounded soldier, I love that you wrote this piece.